We are excited to inform you that Pivot™ now has citation ingests from ORCID. This is a big step in further enhancing the accuracy of profiles and ultimately improving funding recommendations for Pivot users. 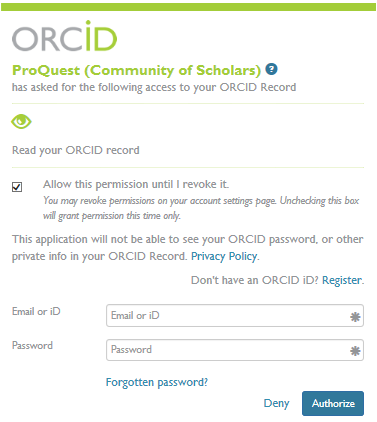 ORCID provides a persistent digital identifier (ORCID iDs) for researchers, which they can connect to their contributions and affiliations during their regular activities, including submission of manuscripts, dissertations, or datasets; grant application; and in student or employee directory and profile records. Read the news release. With this integration, Pivot users now have the ability to dynamically link to their ORCID record as maintained in ORCID’s growing, community-driven scholar profile repository. Once a user links their profile with their ORCID record, ORCID will notify us each time the ORCID record is updated. Also, previously ingested ORCID citations are detected, so the profile citation data remains clean and duplicate free. It saves your time and effort as we automatically link your Pivot Profile to ORCID. The deeper integration of ORCID enables Pivot to receive future automated profile data updates. Pivot will be able to enhance the accuracy of Pivot’s proprietary and acclaimed personal recommendation engine for all users. As a member of the ORCID community, ProQuest is committed to ORCID integration in key research workflows as it supports linkages between a researcher and their professional activities ensuring that their work is recognized and useful. Over time ProQuest will develop a deeper integration with ORCID including: “Transfer information - Connect and sync information between member systems and the Registry and Create a new record; and facilitate the creation of new ORCID records for researchers. "By embedding persistent identifiers into key research workflow tools like Pivot, researchers will better discover relevant collaborators and we will provide more accurate recommendations to researches based upon their profiles. ProQuest is committed to ORCID integration in our research workflows as it supports automated linkages between a researcher and their professional activities ensuring that their work is recognized and meaningful." Linking your ORCID ID. It’s Easy and just two steps away!! Create or add your ORCID iD using the ‘Edit’ profile button. Pivot® Makes Claiming Your Profiles Easier!